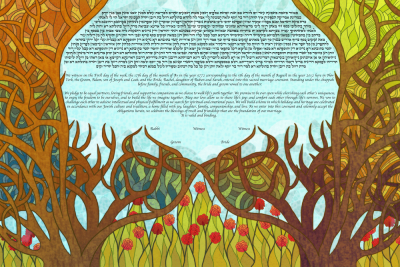 Inspired by the beautiful stained glass works of art found in synagogues and temples across the world, the Stained Glass Orchards Ketubah captures the awe and beauty of the Tree of Life, or Etz Chaim. 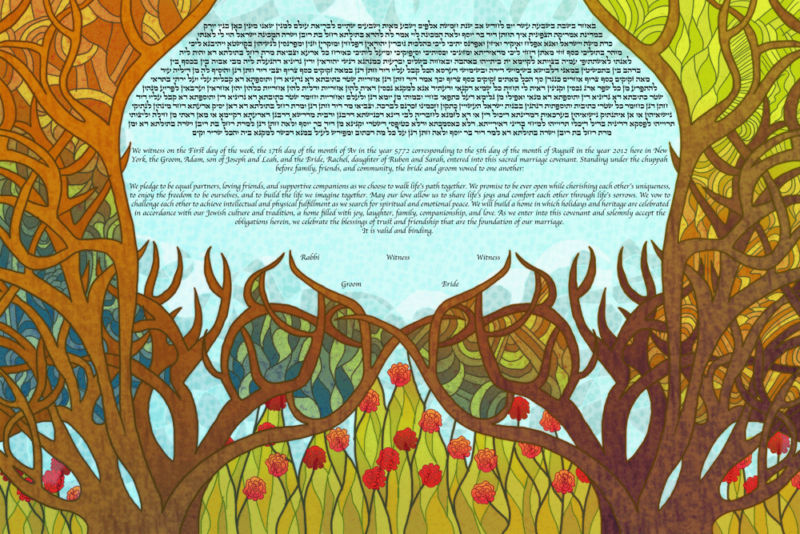 With delicate colors and a textured feeling of genuine stained glass, this Ketubah calls on traditional themes of prosperity and beauty in Jewish artwork. Couples will grow intertwined with each day of their marriage, just as the trees depicted form a beautiful orchard, sharing good weather and the challenges of life. The gorgeous shaded background of the Stained Glass Orchards Ketubah provides a feeling of warmth, joy, and color. L’Chaim!